Danny Crichton is an award-winning researcher and writer on regional innovation hubs with an intense passion for building companies and building nations. He is currently a doctoral student at the Harvard Kennedy School and a contributing writer for TechCrunch. Millennials are rejecting home ownership across the land. Millennials aren’t buying crap anymore, destroying businesses that, well, sell crap. Millennials are changing the workplace to be, I kid you not, more friendly to “millennial values.” Millennials this, millennials that, and those are just some of the stories published this week on this critical, hot-button issue. Frankly, as a millennial, I’d like to copyright the term and earn a royalty every time it is uttered. Like that Happy Birthday song. I hate this generational garbage as much as the next person, but there is a kernel of truth that people born in the same years face similar contexts in their lives. My generation witnessed 9/11 and the wars in Afghanistan and Iraq at a very formative age, and we were hit with the global financial crisis right as we were expected to get started in the workforce. That colors your worldview. Few industries will face a greater struggle targeting these new consumers than banks, who seem wholly unprepared with what to do with us. Indeed, if ever there was a dark evil in the world that millennials as a whole would probably like to see completely destroyed like San Francisco in San Andreas, it is the banking industry. The banks aren’t ignorant. Jamie Dimon, the head honcho of JPMorgan Chase, told shareholders this year that “Silicon Valley is coming” with “hundreds of startups” providing alternatives to traditional banking services. Banks are here to stay – for now. It is clear though that startups, often led by millennials and ushering in millennials as early adopters, are coming for the heart of the banking industry. How it responds will determine who owns the capital of the most important capitalist country in the world. Every generation has its financial goals. For much of the past few decades, the goals have been independence through home and car ownership along with a growing retirement account to supplement Social Security and pensions. Not surprisingly, banks have catered to these desires with a bevy of products, including vastly increased mortgage lending (in fact, increasing to the point of catastrophe as we recently witnessed) along with home-equity loans, investment and retirement advisors, and a customer service relationship centered on local branches. Millennials have entirely different life goals, and yet, financial institutions have yet to respond with the kinds of products needed to satiate them. Just to start, this generation has the greatest levels of student debt in the country’s history. That means that almost all the products currently offered by banks are mostly irrelevant, since major purchases like homes will be pushed back, perhaps indefinitely. I’ll talk about customer service in a moment, but it is clear that there is a gaping hole in the market here that the traditional banks seem all but blind to. That said, big banks have been a bit more engaged around improving investment advising. Many now offer automated investment accounts directly or through contracted brokerages, just like fintech startups Wealthfront or Betterment. These tools have traditionally targeted millennials, who seem more comfortable with computers handling their money and who also desire a well-balanced investment portfolio (we did survive that global financial crisis after all). There are all kinds of other financial products that traditional banks should be engaging with. Newer models of credit scores, like those from Affirm, could greatly help younger workers find loans. RobinHood and others are trying to show that stock trading fees are obsolete. Banks have so many opportunities to engage with millennials, it is disappointing to see how much they have ignored this demographic. Yes, we want banks to engage with us, but no, please don’t talk with us. I have only once ever walked out of a bank branch as a completely satisfied customer (this trip may also have involved free candy). Automated investment platforms are not just popular due to their lower fees and balanced risks, but also because traditional investment advisors had no fricking idea what they were selling (yet somehow still became rich in the process). Traditional banks have moved many of their banking functions online or at least to ATMs, since every in-person transaction has a significant cost attached to it. But so far, none of them has developed the user experience and product quality necessary to really take full advantage of mobile and the web for banking. Simple Bank, the startup acquired last year by BBVA, tried to reach a point where everything could be done through mobile. They missed the mark, but the potential is still there. With Nimbl acting as a “Uber for ATMs” and several other new startup banking services, this dream seems much less far-fetched than it did just a year or two ago. I want a bank where absolutely everything can happen through my phone, and if I need help, I can ask a banker about something instantly through the click of a button. I want a concentrated set of services designed just for me, and not a menu with more than fifty options for services that aren’t even relevant for me. I want to transfer money in ten seconds – not ten screens. Along that simplicity theme, part of shedding all of these human touch points is also reducing the complexity of banking products. Every time I go to a bank, there is a rigamarole involved as we go through the new-account-type-of-the-month, each of course with their complex tiers of fees. I know this is designed to screw me, and I don’t like it. Simplicity is golden. Yes, millennials are annoying customers, but here is the irony: everyone wants these features. Consumers want to be able to manage their finances from their phones and tablets while limiting their visits to bank branches and bank tellers. Plus, everyone hates bank fees, particularly their complexity and lack of transparency. The difference today is that millennials are willing to shop elsewhere, because we are simply not going to accept that these are the only products on the market. We are willing to try new startups and their innovations, since they speak our consumer language while the traditional banks do not. If the big Wall Street banks fail in this new environment, it won’t be because they failed to bring millennials into the fold. It will be because they will have failed to innovate for all of their customers. though it shortens considerably the time it takes to create a post. Automattic, the company behind WordPress.com, announced Tuesday that it is acquiring the team and company behind the popular WooCommerce WordPress plugin. WooCommerce is a WordPress plugin that lets site owners turn their self-hosted WordPress website into a bonafide online store. Launched in 2011 by WooThemes, WooCommerce has become a force in the ecommerce space. Not only it is hugely popular in the WordPress community, WooCommerce is huge when it comes to the online store space, powering at least 650,000 online stores. I spoke to Mullenweg about the acquisition and what adding the Woo team means for the future of WordPress and Automattic. He wouldn’t offer up the price of the acquisition, except to say that it is Automattic’s biggest ever and that it is six times as much as any other acquisition. Automattic raised $160 million in funding last year, bringing it into unicorn club with a valuation of $1.16 billion. WordPress (either hosted or self-hosted) now powers 23% of the web and has become a core framework for publishing. With the acquisition of WooCommerce, Mullenweg said that this is another step that will help WordPress accomplish its goal of powering even more of the web. The ultimate goal, he said, is to make it as easy to create your own storefront as it currently is to create your own website or blog with WordPress. WooCommerce is easy to use — especially in the realm of ecommerce solutions — but it still requires some hand-holding during the setup process. Mullenweg said that one of the goals moving forward will be to make it easier to setup WooCommerce. He also hinted at 1-click install solutions as being on the horizon. Mullenweg also made a point to say that WooCommerce is an extremely profitable company. The core WooCommerce plugin is free but the company makes money selling plugin extensions, storefront themes and support. Sources close to the company said that WooCommerce’s revenues are in the eight figures. That’s serious money and this is just with four years of development. Anecdotally, I’ve met a number of different web developers over the years who have increasingly added WooCommerce to their repertoire or focus on integration areas for their own services. Easy-to-build shopping solutions is increasingly a selling point for web solutions. WordPress.com competitors such as Squarespace have storefront modules and there are also hosted solutions from companies such as Shopify, Big Cartel and Bigcommerce. Mullenweg things that WooCommerce has a unique role in the larger ecommerce space, in part because of its open source nature and its broad community of users and developers, but also because it fills a hole for a a solution that can be wholly controlled an run by the user. That same type of “community content domain” is an area WordPress has excelled at in publishing for over a decade and Mullenweg thinks this will be important to the future. Automattic turns ten years old next month and Mullenweg told me that he’s never been more excited about the future and potential of the web than he is right now. Mullenweg said that starting now, the WooCommerce team will have full access to Automattic’s broader resources of tech and people. In the short term, not a lot will change — the extensions, themes and add-ons for WooCommerce will continue as usual. Mullenweg said to stay tuned for some plans in the next few months, especially when it comes to making WooCommerce easier to use. As for when users can expect to find WooCommerce options on WordPress.com, Mullenweg said that won’t happen until next year. The focus for now will be on making it easier to install and integrate. Mullenweg will also be hosting a Q&A on his blog regarding the acquisition, so users and developers can ask questions about what this means for them. I live on the web, so I’m not unfamiliar with all the studies on the “sitting disease.” Nor am I unfamiliar with the the slightly horrifying graphics that show its health hazards—including sore necks, muscle degeneration, and foggy brains. And yet, when it comes to telling myself to step away from my desk and go to the gym, I simply can’t do it. That’s why I’m excited to have stumbled upon these 17 desk stretches from Officevibe, a company committed to giving organizations the tools they need to become amazing workplaces. These stretches will in no way have the same effect as going to the gym a few times a week, but doing a few every day is much better than sitting hunched over at your desk for hours-long periods. From the “One Arm Hug” to the “Proposal” to the “Ballerina” to the “Knee-Jerk,” there are more than enough stretches to add to your routine. You know what they say: A few desk stretches a day keeps the doctor (farther) away. Windows 10 is planned to launch this summer, hopefully by the end of July. Updates to Windows after the windows 10 release is planned to follow an incremental path, with a monthly charge, that would lead to ongoing improvements instead of splashy, more occasional numbered launches. Microsoft’s decision to fully embrace releasing continuous updates marks a big change in the way it conceives, markets and sells its desktop Operating System. Microsoft has, especially under new CEO Satya Nadella, made the move to become much more of a services company. Putting Windows into a bundle of services would be a strong move towards increasing the overall value of Microsoft products. Moving to a more gradually iterative model would probably have benefits in terms of engineering resource allocation and keeping pace with the increasingly rapid adoption of new tech. Microsoft has announced that Windows 10 will be a free upgrade for eligible devices for the first year after 10’s official launch; however, it’ll still be looking to acquire revenue from sales of this Operating System. Maybe Windows 10 will become part of a larger services bundle that expands on what Office 365 currently provides. Little by little, Microsoft is revealing additional information about Microsoft Edge, it’s upcoming browser replacement for Internet Explorer. Not only does Microsoft Edge have a new look and feel and a new rendering engine — it also has a new take on security, web standards and legacy code. The biggest change for developers coming with Microsoft Edge is that it will get rid of legacy browser technologies including ActiveX and Browser Helper Objects (BHO). Just because ActiveX is going away doesn’t mean Flash is dead. No, Microsoft will be building Flash into the browser — much as Chrome does now. Microsoft Edge will also support native PDF rendering. Microsoft says it has removed 220,000 unique lines of code (LoC). At the same time, it is adding a ton of stuff to the new browser. More than 300,000 LoC have been added, as well as 49 new major features and 4200 browser interoperability features. Microsoft is also getting rid of vendor prefixes for Edge. This means that in order for developers to take advantage of special HTML5 or CSS features, they won’t have to use a specific Edge prefix. Instead, they can just code to web standards. This is a move in the right direction for Microsoft and it mirrors some of the recent hires the company has made in the area of open web evangelism and web standards. Microsoft lays out how it is building its new browser to better be able to stand up to web threats, as well as how its updated model will be better than before. Getting rid of ActiveX and BHOs will actually make the browser more secure. For years, third parties have exploited the binary aspect of ActiveX to execute nasty code that can take down the browser or the underlying operating system. The biggest feature for security, however, might just be in how Microsoft is treating Edge. It also means that as a Universal Windows App, users can get updates from the Microsoft Store — as opposed to updates being tied to Windows Update. Decoupling browser updates from the rest of the operating system is great, especially for keeping stuff up-to-date. It also opens up the door for Microsoft to do the kind of automatic updates that Chrome and Firefox do now. Microsoft Edge will debut alongside Windows 10 when it launches later this summer. Hopefully, Microsoft won’t require the purchaser to buy something that the buyer doesn’t want in order to get what they do want. I would never pay monthly fees to use an operating system. This goes beyond the idea of paying fees for the programs ran on top of Windows OS. Basically, paying one more set of fees is a bit much…. This is exactly what I am afraid of. An Internet only based operating system with fees for different levels of services. Just give me a local based OS not requiring Internet 24/7. Scott Bradley They compared it to Adobe’s new structure. Which, is monthly fee based and offers different service levels. They also stated that Windows X will be free for the first year. That is clue enough. Mind you, none of this is confirmed either way, but I am seeing a volatile pattern here that waivers from Windows being truly “free” and Microsoft’s greed kicking in. General Electric (GE) has announced plans to produce an LED light compatible with Apple’s HomeKit software. The integration will include the ability to control the GE lights via Siri, Apple’s voice-interface digital assistant. Using GE’s Align technology, the HomeKit-enabled bulbs will allow users to align their lighting with their sleep cycles – bluer tones in the morning hours and more amber-colored lighting in the evening. Those familiar with the app called f.lux are already aware of the benefits of using blue lighting in the daytime (to suppress the output of melatonin) and amber lighting at night (allowing for an easier transition from wakefulness to sleep) as a way to keep the body’s circadian rhythm intact. Lighting is how many first experiment with the idea of a smart home, and our insights show that consumers want the ability to control lighting from anywhere, automate lighting and pair lighting with other devices—like sensors, thermostats and door locks,” said Beth Comstock, the CEO of GE Business Innovations, in a statement on the company’s website. The HomeKit integration will give users the ability to control several LED units simultaneously, as well as the option to pair the LEDs with any iOS device (iPad, iPhone or iPod touch). Perhaps the most exciting aspect of the announcement is the ability to control the lighting using Siri on your iOS device. Harnessing a voice interface many mobile users are already familiar with within a smart home set up could be the key to getting users interested in GE’s smart LED system. Voice controlled appliances, another technology first by Star Trek more than 40 years ago! The HomeKit-enabled lighting system will be offered commercially later this year. I want at least one of these! This month marks the 50th anniversary of Moore’s Law, an observation made by Intel co-founder Gordon Moore in 1965 that computing would increase in power and decrease in cost at an exponential rate. Technically, Moore’s Law is about shrinking transistors and adding more of them to integrated circuits. “The more transistors you can get onto a chip, the more that chip can do,” explains Steve Brown, Intel’s futurist. So where will Moore’s Law take computing next? “Being able to put computing into every object in our lives. Being able to make objects that are smart and connected and allowing you to change the nature of those objects to make them more useful for you,” says Brown. Brown gives the example of a smart teddy bear that can read a book to a child or a toothbrush that can check to make sure children are brushing their teeth correctly. “You can start to till computers into soil and measure from a farmer’s perspective where to water. If you’re in drought conditions like in California right now, that’s a big deal,” he says. One of the biggest breakthroughs that will happen in the next 10 years will be a computer that can really see and understand the world around them, says Brown. “That’s what will really enable robots to be successful and escape the pages of science fiction and be amongst us.” This will also enable driverless cars, he says. We’ll also have computers “in, on and going through,” our bodies in the next ten to fifteen years. “It’s worth doing if it helps monitor health and health conditions,” he says. “You think about pacemakers and insulin pumps that have been around for decades, the next logical step is there will be implantable computers that will help you monitor health conditions,” says Brown. He points to work already going on with computers monitoring nervous systems and sending electrical impulses to help control conditions like chronic pain. I’m beginning to realize just how important energy is to me in so many ways. To run my devices, cars, microwave, refrigerator, myself and most importantly in Florida, where I live, an air conditioner. Milliamp Hour (mAh)t Milliamps Hour (mAh) is important because it’s the easiest way to distinguish the strength or capacity of a battery. The higher the mAh, the longer the battery will last. Batteries with different mAh ratings are interchangeable. 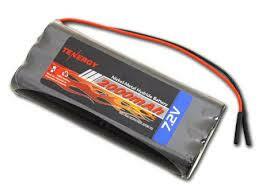 If your battery is rechargeable then the mAh rating is how long the battery will last per charge. Think of a car’s gas tank. Voltage is how much gas is being used, and mAh is the size of the gas tank. The bigger the gas tank (mAh) rating the longer the device will run. If your battery is rechargeable, then think of the gas tank as refillable (rechargeable). A unit of current equal to one thousandth (10-3) of an ampere. These harmful programs are one of my biggest pet peeves. I try not to feed them, but they still show up occasionally. Once they have attached them selves to a computer, they are frustratingly difficult to get rid of. Google has added a new warning to Chrome that pops up before users visit a site that will encourage downloads of unwanted software, the search engine announced on Monday. The red warning, pictured above, lets readers know that the site they’re about to visit “might attempt to trick you into installing programs that harm your browsing experience” by, for example, switching your homepage or injecting extra ads on your screen. Chrome already has a warning that pops up once a software download is initiated. In addition, Google’s search engine has added a framework that better helps Google pick up on deceptive sites, reducing the likelihood that they will show up in search results. Google has always touted cybersecurity as a top priority. Recently, Google has begun disabling ads that could lead to websites that encourage unwanted software downloads. The company has got itself into hot water with other major tech companies for revealing problems in non-Google software, like a Windows security hole. In January, Google published a roundup of 12 security tips for its users. The tech giant even offers a security checkup tool that reviews your Google account’s security settings. Unfortunately, unwanted software downloads have become all too common. The new Google warnings add a mild extra layer of protection. This is a repost of a fascinating article By Alexandra Ossola Posted April 20, 2015. This is also one of two articles I found in less than an hour mentioning a 3D printer. I think we humans are on to something here! Our eyes are such elegant, complex, specialized organs that their existence seems almost hard to believe–Darwin himself called their evolution “absurd.” But that doesn’t mean they’re perfect; eyes sometimes don’t focus correctly, they break down over time, and they can be extremely painful if infected, irritated, or exposed to light that’s too bright. Italian design firm MHOX has an ambitious idea: to improve human eyes by making synthetic replacements. “Developments in bioprinting and biohacking let us imagine that in the near future it would be possible to easily print organic, functional body parts, allowing the human to replace defected districts or enhance standard performance,” lead designer Filippo Nassetti told Dezeen. The concept, called Enhance Your Eye (EYE, of course), would entail a 3D bioprinter, which uses a needle to drop different types of cells into the appropriate alignment and structure. Bioprinters can already make organs such as ears, blood vessels, and kidneys, but eyes remain elusive because of their complexity. 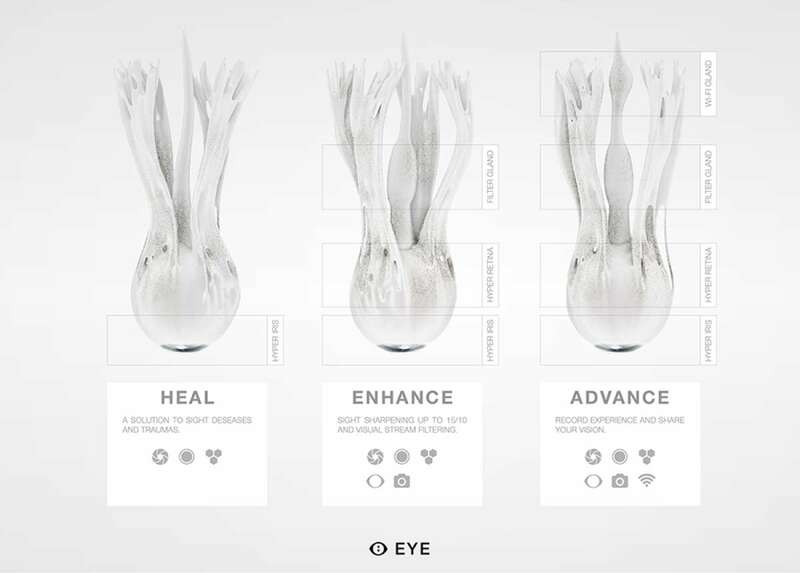 The way Nassetti envisions it, users could choose between three different types of synthetic EYEs: Heal, Enhance, and Advance. The first is a synthetic eye that basically works just like a natural one and could serve as a replacement for people with diseases or traumas that would otherwise be blind. EYE Enhance seeks to improve the eye’s natural functions by improving vision to 15/20 and enabling filters on vision like those on photo apps (such as vintage, black and white). To turn on or change the filter, a user can take a pill. The third type, Advance, has additional glands to capture or record what a person is seeing, as well as a Wi-Fi connection to share those images. In order to use an EYE system, people would need to get their natural eyes surgically removed and replaced with the Deck, a sort of artificial retina that connects to the brain and would allow users to plug in different eyeballs at will. The designers behind EYE predict that the product will be on the market in early 2027, but they haven’t released any information about what the Deck looks like or how the system actually looks in a person. (It’s one thing if it looks natural, it’s quite another if the Deck sticks out and makes people look like mutant cyborgs.) And though 3D bioprinting is advancing quickly, making an eye might prove more challenging than anticipated. As exciting as EYE seems to be, it’s important to note that there may be a number of hurdles that come up in the interim years that make the system less desirable–or even impossible–to use. Written by Alex is a science writer based in New York City. She has contributed to The Atlantic, Motherboard, Audubon Magazine, The Verge, and Fast Company. When she’s not geeking out, Alex likes to travel, hike, do yoga, and (try to) cook new foods.